The Life of Blessed Bernard Mary Silvestrelli C.P. It is a great joy to present this biography of the twelth Superior General of the Passionist Congregation. 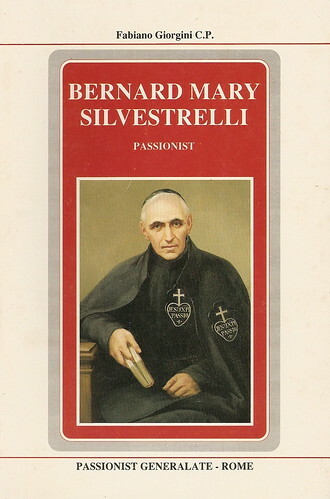 Blessed Bernard Mary Silvestrelli lived as a member of the Congregation for fifty four years, the greater part of which time he spent in various posts of responsibility in the service of his brethren. For almost quarter of a century he was Superior General of the Congregation, amid considerable personal suffering. Blessed Bernard was a man who attained a high level of personal liberty. From the beginning of his religious life, he saw faithfulness to the Rule and Constitutions as the expression of obedience to the will of God. His luminous fidelity to the Passionist life style formed in him a spirit that was truly free from all human respect and worldly standards. Instead of being ruled by such desires or standards, Bernard freely choose to live according to the spirit, the norms and the practices of the Congregation of the Passion. His resolve was to live Passionist community life with all his strength, in a manner that was “exact, faithful, entire”, and this demanded a high and consistent level of commitment on his part. It was this daily faithfulness, in prayerful union with Jesus Crucified, that gradually brought hm to those heights of inner freedom. The years of his Generalate were particularly difficult. The Congregation was still struggling with the persistent efforts of some religious to reduce the contemplative and communitarian aspects of Passionist life to a secondary position. Some of the brethren wished to exercise the parochial ministry rather than the specific Passionist apostolate of preaching. In Italy, the Congregation was beginning to recover, after the suppression of the religious houses. In France, the process of suppression was just beginning. Blessed Bernard’s fidelity was not sterile. He knew how to use common sense in granting dispensations when they were necessary. He was always generous in giving permissions, insofar as they were compatible with the spirit of the Passionists. He was a far sighted Superior. Under his guidance, the Congregation grew within Italy, and new foundations were begun in Argentina, Chile, Mexico and Spain. He introduced minor seminaries or aluminates into the Congregation. Before the law of the Church required it, Bernard favoured that a period of temporary vows should procede perpetual profession. Aware of the great problem in reconciling parochial responsibilities with fidelity to the Passionist life style, he saw the special advantage of undertaking the pastoral care of sanctuaries, and the compatibility of this work with the Passionist Rule and Constitutions. It is therefore with real pleasure that I present this account of such an illustrious and holy religious. I am delighted also for another reason: for thirty five years I have known and admired the author of this book, and we have for a long while worked together in close collaboration. Paul M. Boyle, C.P., Superior General. This entry was posted on 8 December, 2007 at 12:58 pm and is filed under CP. You can follow any responses to this entry through the RSS 2.0 feed. You can leave a response, or trackback from your own site.